Do William Shatner and poetry go together? As a matter of fact, they do in Shatoetry, his brilliant, fun iPhone, iPod Touch, and iPad app. You can create poems with a slick interface, and William Shatner’s voice reads them. 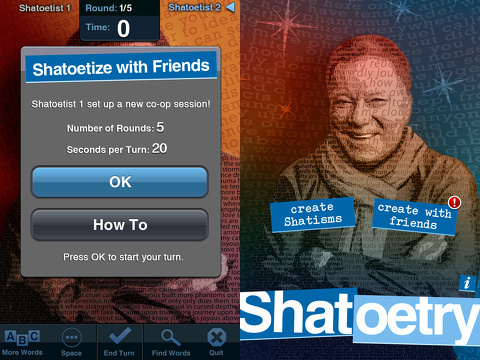 The Shatoetry iPhone app is introduced with an excellent tutorial with pop-ups and arrows. The directions are clear and concise, and the added punch of the cheeky, lounge singer opening and transitions creates a fun vibe. 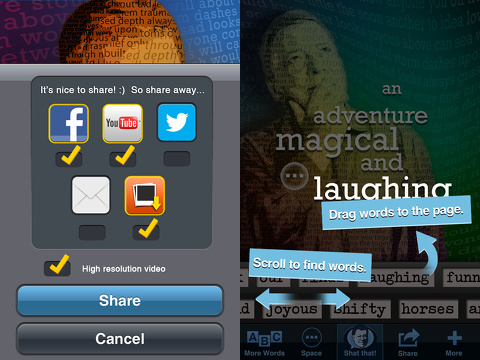 The interface of the Shatoetry iPhone app is both visually appealing and highly intuitive. There is a main menu bar at the bottom of the screen with one touch navigation like Instagram. You can get more words, create a dramatic pause, share, and play an audio clip of William Shatner reciting your poem. Just above the bottom menu bar is a bar with words like refrigerator magnets. It can be scrolled with horizontal finger swipes. When you select your word, you touch the word and drag it onto the screen. The main part of the screen is a sweet graphic of William Shatner that has been transformed with rich color and texture provided by words melting into the background. When you create a poem with the Shatoetry iPhone app, you use agile gesture controls. You simply touch a word and drag it onto the screen. You continue to arrange the words by moving them with your finger. If you want to find a different word that is not available at the bottom of the screen, you can access the extensive list of available words with one touch on the “more” icon in the bottom menu bar. When you craft your poem, you may want to emphasize certain words. You tap your word and it is enlarged. There are three different levels for each word. The interface for creating dramatic pauses is similar. You tap the space icon at the bottom of the screen, drag it to the desired position, and tap it to enlarge the icon. Again, there are three different lengths of a pause. The ability to emphasize words and determine a pause’s length brings sophistication and customization to iOS poetry apps. If you hate your entire poem, you just shake it to clear the poem. When you have finessed your poem, you touch the “Shat That” icon to hear William Shatner read it. It is not completely smooth in delivery, but neither is William Shatner. He has a very methodical, precise, and sometimes wonky way of speaking, but it works so perfectly with this poetry iPhone app. I am pleasantly surprised by how accurately the words and pauses of my poem are created. When complete, you can share to Facebook, Twitter, YouTube, and email. To share on Facebook and Twitter, you must also it to be shared to YouTube. You can, however, share to email or save to your iPhone without posting to YouTube. You can also select whether or not you want to share as a high resolution video. One other interesting sharing feature is the ability to create poems with friends. The Shatoetry iPhone app is a great cocktail party trick, but it is also an engaging tool to get your kids involved with poetry. The gesture controls make it fun, and it is a blast to hear William Shatner read it. The price tag is just $.99 for tools and features that are much better than many other comparable iOS poetry apps. AppSafari review of Shatoetry was written by Jenni Ward on December 3rd, 2012 and categorized under App Store, Fun, Social. Page viewed 3197 times, 1 so far today. Need help on using these apps? Please read the Help Page.